Iranian President Mahmoud Ahmadinejad has played down the threat of an armed conflict between his country and the United States or Israel. "I assure you... there won't be any war in the future," he said in Malaysia. Earlier, an aide to Iran's supreme leader said Tehran would strike Israel or the US navy in the Gulf if it was attacked over its nuclear programme. The comments come amid reports of possible Israeli or US plans to strike Iran's nuclear facilities. Tehran denies Western claims that it is seeking to build a nuclear weapon. It has repeatedly rejected demands to halt enriching uranium, which can be used as fuel for power plants - and as material for weapons if refined to a greater degree. The European Union imposed new sanctions on Iran in June. But it has offered a package of incentives to persuade Iran to suspend uranium enrichment. Iran has said it is prepared to negotiate with major world powers, but insisted the talks had to address Iran's nuclear rights. President Ahmadinejad was speaking through an interpreter at the end of a summit of the D8 Islamic developing nations in Malaysia's capital, Kuala Lumpur. He said he believed that people in America would not let President George W Bush authorise an attack on Iran because it would be "political suicide". "The economic, political and military situation will not let Mr Bush do that," he said. But Mr Ahmadinejad warned that Iran was ready to defend itself, saying that "the greatest threat in the Middle East and the whole world... is the United States' intervention in other countries". He also suggested that Iran would not launch any attack on Israel - America's ally in the Middle East. "There is no need for any measures by the Iranian people" to bring about the end of the "Zionist regime" in Israel, Mr Ahmadinejad said. And asked if he objected to the government of Israel or Jewish people, he said that "creating an objection against the Zionists doesn't mean that there are objections against the Jewish". He added that Jews lived in Iran and were represented in the country's parliament. 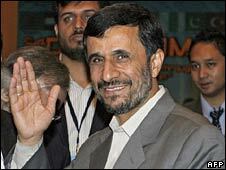 Mr Ahmadinejad's comments came after he was asked to clarify the statement that he wanted to "destroy" Israel. On Monday, a senior Iranian official warned that Tehran would retaliate if attacked by the US or Israel over its nuclear programme. 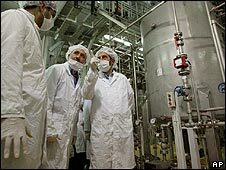 "The first US shot on Iran would set the United States' vital interests in the world on fire," Ali Shirazi, an aide to Supreme Leader Ayatollah Ali Khamenei, was quoted as saying by Iranian news agencies. "Tel Aviv and the US fleet in the Persian Gulf would be the targets that would be set on fire," he said. "The Zionist regime is pressuring White House officials to attack Iran. If they commit such a stupidity, Tel Aviv and US shipping in the Persian Gulf will be Iran's first targets and they will be burned in Iran's crushing response. "The Iranian nation will never accept bullying. The Iranian nation is a nation of believers which believes in jihad and martyrdom. No army in the world can confront it," Mr Shirazi said. Last week, the top US military officer said opening up a new front in the Middle East - after Iraq and Afghanistan - would be "extremely stressful" for US forces. Adm Mike Mullen, chairman of the Joint Chiefs of Staff, was commenting on the likelihood of US or Israeli military action over Iran's nuclear programme. President Bush has maintained that all options are on the table but that military action against Iran will not be his first choice.